The world is saved ! The ‘Tap are reforming for Live Earth ! While rock fans have been dreaming of a Spinal Tap reunion for years, an important enough reason for the band to get back together has remained elusive. What possible cause could be big enough bring back the band who have seen it all, played it all and, later, scooped it all into a box so they could take it on their tour bus with them? The answer has become clear today, however, after it was announced that the legendary UK act led by Nigel Tufnel and David St Hubbins are to reform in order to fight global warming. A new film delving into the band’s eco-consciousness is to be screened today, and they will back it up with an appearance at this summer’s Live Earth festival. This budding awareness is borne out in the lyrics to new material recorded by the band, including a new single, Warmer than Hell. Reiner provided a sneak peak at the lyrics: “The devil went to Devon, it felt like the fourth degree/He said, ‘Is it hot in here, or is it only me? 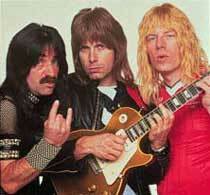 '” It is hoped the single will contain a three-minute solo by bassist Derek Smalls.